Searching servers has never been so easy: The new HLSW version 1.3.0 introduces the Global Serverlist View. 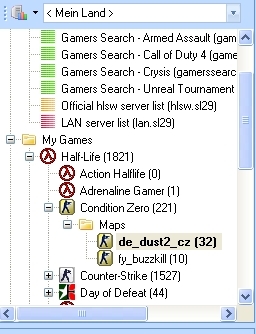 The comfortable tree-system arranges all Internet game servers in handy categories. That will help you to find your desired server with just a few mouse clicks. Even your existing favourites are easily managed by the global view. For information about the bugfixes, additions and changes visit the changelog. sxe can not be recognized by the game when connecting CS with new version. still using 1.2.0 for this reason. This latest version does not seem to be working properly. I saw somewhere that HLSW is blaming STEAM and STEAM is blaming HLSW. The problems that I see is the timelimit is not working. When you try to change the rules, it does not go thru. I don't really care who's fault it is, can it just get resolved, please? Admin Notificwation seems to have vanished?? Still in the Wiki.